The practice of handing out treats at Halloween is a long-dated tradition; first originating in the medieval period as young children would go door to door praying for household souls in exchange for treats. This evolved in the 1930’s as those households offered treats to children so that they wouldn’t play tricks. Our Gresham dentist understands the fun and excitement involved in the Halloween holiday, but we see the downside as well in the form of cavities. So, let’s take a look at how you can enjoy the sweets without risking your teeth and oral health this year. Healthy snacks are one thing, but continuous eating causes health risks. Snacking on sweets is even worse. Our Gresham dentist and hygienist talk about brushing and flossing on a daily basis for the improvement of your oral health, but also because we don’t want to see decay building up on your teeth. Plaque forms on teeth within 4 to 5 hours after brushing. Food particles and sugar help feed plaque. By brushing twice a day, plaque is kept at bay. Keep snacks to a set time in the day and brush your teeth afterwards in order to remove the sugar that is sticking to your teeth and your child’s. 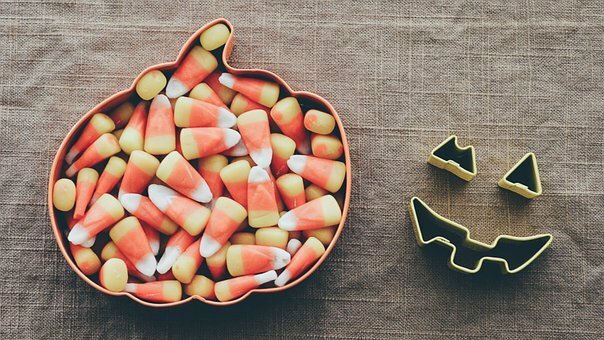 Many different candies will come pouring out of your child’s Halloween bag or bucket this year. Sit with your family and sort the candy at the end of their revelries. Sticky candy like toffee, gummy candy, and taffy should go in one pile. These candies stick to teeth and make it more difficult to remove from teeth. This increases the risk of cavities. Toss this candy or look into local charities that have outlets for candy. Some will ship candy oversees to our soldiers, or you can make your own care package to send along with socks, healthy snacks, toothbrushes, and other necessary toiletries. Water serves an important role in healthy bodies. It hydrates us, keeps our gums and soft-tissues healthy, and helps rinse food and bacteria from our mouth and teeth. Most city water has fluoride added to it which adds extra protection to teeth and prevents cavities. Talk with our Gresham dentist about fluoride treatments for your children, too. Fluoride strengthens the enamel on teeth and helps prevent decay from wreaking havoc on teeth. At the end of the day, good oral health is the goal. It is possible to enjoy trick or treating without jeopardizing your smile. Enjoy a treat or two but be prepared to brush your teeth as soon as possible and floss between your teeth. Sweets after dinner is best when saliva production is at its highest so that the sugar is somewhat washed away until your child can brush. Look to our Facebook page for additional oral hygiene tips or talk with our smile team to learn more about how to avoid cavities and decay.